It Only Takes 10 Seconds & It's Completely Free! Plus, You Can Also Listen To Music Whilst Surfing The Web, Stream Over 30 TV Channels For Free, Get The Latest Weather Reports, And That's Just The Start!! Syncbay is a personalized 'Home Page' - a smart and convenient web page that will show automatically, every time you start surfing the web. It's free so there is no need to use your credit card. A 'Home Page' or 'Start Page' is the webpage that loads each time you open your web browser (i.e when you open Internet Explorer, Firefox, Safari, Chrome etc). When I Make Syncbay My Homepage, What Exactly Will I See Each Time I Open My Browser To Surf The Web? Why Should I Have Syncbay As My Home Page? Having Syncbay as your home page will save you a lot of time as you'll have instant and one-click access to the websites that you visit the most. 1. Click on the Amazon.com ' icon' and load Syncbay's Amazon search bar. The results would then appear in a new window and I would then buy the DVD if it were available. However... let's say the DVD was unavailable at Amazon and I had to continue my search elsewhere. I would then click the Google icon which would load Syncbay's Google search bar and repeat the search, hopefully finding what I was looking for. Please note, if I wanted to perform the search at Google's own website directly, I would just click the grey button below the search bar and Google's homepage would appear. Same with Amazon... same with Ebay... same with all the others. Try it out and see! Syncbay is extremely simple to use, isn't fussy and over complicated like some other homepage providers... plus it'll save you time and get you where you want to go online much much faster! Ready To Make Syncbay Your Home Page? It Take Just 10 Seconds! CLICK THIS LINK NOW ! Does Syncbay Offer Anything Else? Secondly, if you think that your friends would benefit from Syncbay you can tell them about us and be in with the chance of winning an Apple iPad and $1000 cash. We'll be picking a winner every single month! 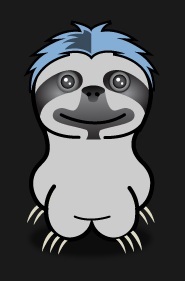 Thirdly, let's not forget about "Cyril", Syncbay's mascot. (That's him above and on the left!). 'Cyril The Sloth' will brighten up your week by showing funny videos each week from within his infamous 'Odd Box'. Make Syncbay.com your homepage today by clicking the button below. It only takes a few seconds. Your online life will be easier, faster and more efficient as everything will be in one place... and with Cyril running the show, much more enjoyable!